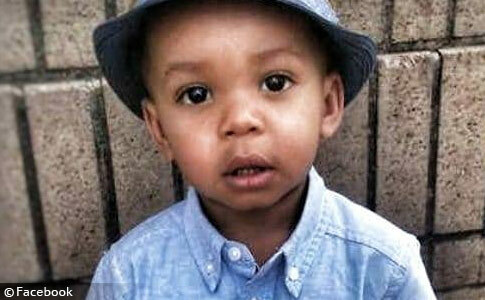 Jaevon Torres, 2-years old, was mauled to death by three pit bulls on August 1. UPDATE 08/03/18: On Friday, the city Medical Examiner's Office identified the boy who was killed by pit bulls in a rowhouse on Agate Street as Jaevon Torres. The cause of death was determined to be "multiple blunt and penetrating injuries" and the manner of death was ruled accidental. 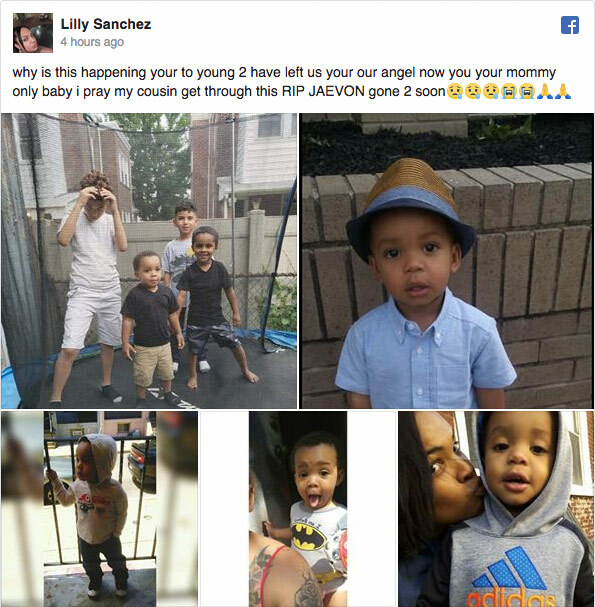 On Wednesday, Jaevon was savagely attacked by three pit bulls in the home while under the care of a babysitter. There were two additional pit bulls in the home that were caged during the attack. One of the adults in the home who was trying to protect the boy was 27-year old Rebecca Olan, a police source told Philly.com. Olan lived in the home, is the owner of the five pit bulls and was babysitting the child at the time of the attack. 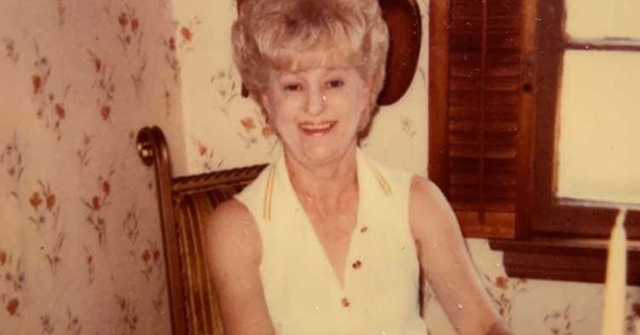 Olan was the boy's godmother, but not a relative. The boy and his mother lived in another location. Upstairs in the home at the time of the attack was Olan's 16-year old cousin and a 25-year old woman. Police questioned all three of them. Earlier news reports noted that there was no furniture on the first floor of the rowhouse -- just five dog cages. Police Commissioner Richard Ross even stated to Fox 29, "In fact, the house wasn't in disarray other than the cages on the inside. It's a bit of a mystery to us." The question of why Olan had five caged pit bulls has yet to be answered. The District Attorney's Office indicated Friday that no decision would be made regarding criminal charges until the death investigation is complete. Last night, police were called to a rowhouse on Agate Street after reports that multiple pit bulls were attacking a toddler. Dramatic cellphone video shows the moments police officers arrived and began open firing through the front doorway before entering the home to rescue the young child. "Their main concern was to get to the 2-year old child who was unconscious, bleeding from his head, face, body, both arms and legs," Philadelphia Police Chief Inspector Scott Small said. Police fired seven shots at the pit bulls, killing one and injuring two others. There were five pit bulls in the household. "The dogs had blood all over them from biting the baby. They had blood all over them," neighbor Jason Rash told NBC 10. 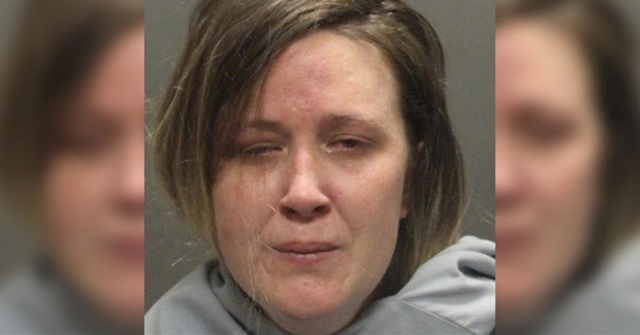 An unidentified female neighbor said the child's babysitter was bloody and in shock. "She had blood all over her shirt. She looked really distraught, in shock. We were all crying. This innocent baby got chewed up by some pit bulls," she said. Ross said that three pit bulls were involved in the attack; two other pit bulls were caged. The 23-year old babysitter, the child's aunt, was not seriously hurt in the attack, Ross said. A 36-year old and a 16-year old were also inside the home during the attack. All of the pit bulls belonged to residents of the home, Ross said. There was no evidence of dogfighting. A woman in the home let one dog out of its cage prior to the attack. Two others got loose at that time as well, Ross said. "[Police officers] made a valiant attempt to get in and save the baby under some very difficult circumstances," Ross said. "With some very powerful animals charging you. And they did the best they could." The Special Victims Unit is investigating whether there was neglect or endangerment involved. "Right now, we don't have any obvious signs of that," Ross said. Neighbors on Agate Street said they had often seen the young boy "visiting family" at the two-story rowhouse. 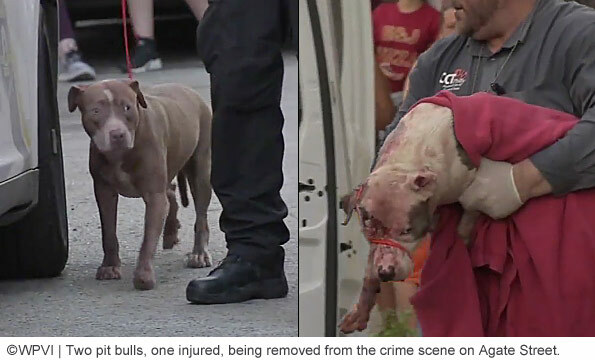 Philadelphia, PA - A 2-year old boy is dead and a 23-year old woman was injured after being attacked by two pit bulls in the city's Port Richmond section. Police were called to a home in the 3000 block of Agate Street about 5:15 pm, where the dogs were attacking a toddler. When police arrived, the pit bulls were actively attacking both victims. Police open fired, killing two of the pit bulls and injuring a third. Police said there were a total of five or six dogs inside the home. The boy was transported to St. Christopher's Hospital for Children in extremely critical condition, where he succumbed to his injuries. He was pronounced dead at 6:05 pm. The female victim was transported to Temple University Hospital. The severity of her injuries remains unknown. Initial news reports say the woman was the child's aunt and was babysitting the boy at the time. The child's identity has not yet been released. Police continue to investigate his mauling death. 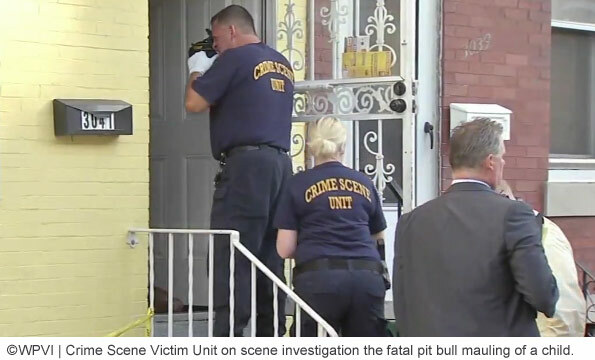 WPVI-TV reports that Special Victims Unit is now investigating the deadly attack to see if charges are warranted against the homeowners for keeping five pit bulls in the home where the attack took place. Philadelphia Police Chief Inspector Scott Small told WPVI that when police arrived, they could see the child lying in the middle of the living room floor and said, "the dogs were around the child attacking the child." Thus police took immediate action, open firing on the pack of pit bulls. "The main concern was to get to the child who was completely bleeding from the head, face body, both arms, and legs," Chief Insp. Small said. Medics rushed the boy to St. Christopher's Hospital for Children, where he died about a half hour later. Neighbor Jason Rash said he tried to help. "All of a sudden I see the dogs plucking at the baby and the aunt and all of a sudden they kept telling me to go in and get the baby, but you can't because they're surrounded by all these dogs." In February, we examined the "Single Dog Shrinking Metric" in fatal dog attacks since the 1980s. From 2005 to 2017, 47% of all deadly attacks involved multiple dogs, up from 30% during the CDC years (1979-1988). Attacks by pit bulls involving more than one dog contributed to 72% of the multi-dog subset. 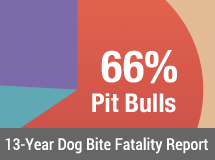 Furthermore, over this 13-year period, 51% of all fatal pit bull attacks (146 of 284) involved more than one dog, vs. 38% (56 of 149) of fatal attacks not involving pit bulls. In our Discussion Notes post, we also talked about the likelihood of serious injuries or death when more than one pit bull is involved in an attack upon a human. Rather than a simple multiplying effect (i.e., x, x + x = 2x, 2x + x = 3x), increasing the number of pit bulls would be an "exponential effect" (i.e., 1 = x1, 2 = x2, 3 = x3), according to Dr. Peter L. Borchelt, PhD, who testified as an expert witness for the City and County of Denver when it defended its pit bull ban in 2005. 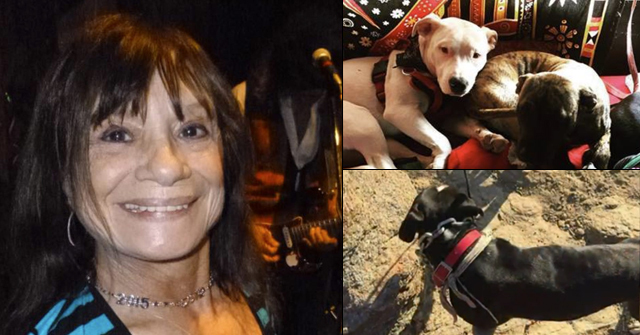 In the Philadelphia attack, it remains unclear where the dogs were normally kept. Were they kept in cages or a room and "somehow got out?" That point is moot -- there were five pit bulls in the home attacking the child and his babysitter. Jason Rash said it the best, "they kept telling me to go in and get the baby, but you can't because they're surrounded by all these dogs." To stack the "death chips" even higher, a mere babysitter was supposed to ward off a pack of vicious pit bulls. It’s too bad that the police didn’t just kill them all. So many resources are wasted in dealing with these killer dogs, as if they are human and deserve due process. And you can thank the No-Kill movement and organizations like Best Friends. They’re the money behind this insanity. The No-Kill movement is one of the least intelligent things that I have seen. As a farmer, breeding with no end point is bad for the animals. You can’t keep all of them alive because there is a limit to resources available. The more individuals there are, the lower the quality of life for each one. What is the point of having them alive if they have to be kept in cages, alone? Pits are also the most abused of the dog breeds. We need to severely limit breeding and cull those that, well, in my point of view, all of them. But that’s as unreasonable to most people as No-Kill is to me. All of them, that’s not unreasonable at all. The only way to ward off a pack of attacking pit bulls is exactly the way the police did it. I hope to god these dog get put down. Well, these dogs look like they have a history of dog aggression. The brown dog on the left appears to have a chronic injury to the left eye with the eye appearing enucleated (blind with loss of volume of the orb. This same dog appears to have part of the left forefoot missing (toes gnawed off). The dog on the right appears to have alopecia either from mange or possibly from an attempt to breed a designer hairless pit bull. It also has a clearly fresh injury to the right side of its face. All this said, I am sure we are going to hear, very soon, that these dogs were never aggressive before and were well cared for, like that matters. I will bet money the image of the injured, bloodied pit bull is now being passed around social media with text to the effect that the mean officers shot the poor innocent puppy for no reason. There will be pleas to raise money for vet care and adopt out the dog. I’d bet the farm. I have come to the conclusion that pit nutters are no different than the brain washed followers of Jim Jones and David Koresh. They truly believe the crap that the pit bull movement spews to them. They lap it up like it’s gospel, and they shun and violently threaten those that oppose or defect from their sick belief system. And, in true Jones-esque fashion, they’re willing to sacrifice their lives and the lives of their children to prove their devotion to their “messiah”. There HAS to be an underlying mental illness connection to pit bull worship. Pit nutters are sick, plain and simple. They are unwilling to step away from the altar of pit worship and truly see how far beyond the pale they’ve gone. Rest peacefully in heaven, sweet beautiful little Javon. You never even had a chance. Five dog cages…ugh. It’s not uncommon for owners of multiple pit bulls to have to “crate and rotate” the dogs. In other words, the dogs are kept crated most of the time, and get turns having time out. This is done when dogs will kill each other if let out together. This practice is most common among pit bull or other fighting breed owners. If you google crate and rotate, you’ll find many pit bull sites. Why any one breeds such ill-tempered dogs is beyond me. Pit bull advocates often state that dog aggression doesn’t translate to human aggression but that is false. When a couple of pit bulls start fighting, they often end up directing their aggression to a person, which I think sadly happened here. An adult has no chance against five berserking pit bulls, let alone a small child. We are certainly familiar with the crate-and-rotate routine. The volume — five adult pit bulls — is what is so dizzying. The day in and day out care of these dogs? The owner was only 27. Pit bulls and other fighting breeds should be legally recognized as dangerous breeds. If a dog attacks and fatally injures someone, the owner should be charged for manslaughter, without having to prove that they “knew” the dog was dangerous. One look at these dogs tells you they are dangerous, by default. That sick woman had five dangerous dogs in the house, not even in cages, and allowed a child to walk around these dogs. It’s disgusting that she is not going to jail for that. Even the country these blood sport dogs were developed are banned. Only America allows dogs to kill people randomly. We don’t allow people to do this, why these dogs! You cannot change the genetic DNA of these blood sport breeds. America wake up! These dangerous animals needs to banned from every community in the United States, mandatory neutering and spay so they won’t be able to breed. How is it that wolf dogs are illegal to own but these killer dogs are in our communities?